NETWORK FINALS: There were 0.1 bumps in final numbers for GREY’S ANATOMY, THE BIG BANG THEORY, MASTERCHEF JR and the rerun of SUPERSTORE. RIVERDALE, however, dipped by 0.1. CABLE HIGHLIGHTS: ESPN’s NBA PLAYOFFS games were inevitably at the top of Thursday cable, at 1.85/1.58 (led by Utah vs. Golden State). 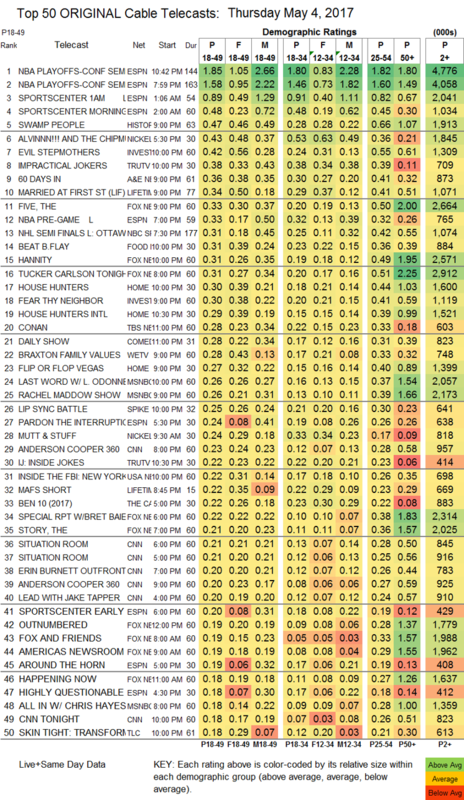 The highest-rated regular series of the night was History’s SWAMP PEOPLE, up 0.09 to 0.47. Nickelodeon’s 5:30PM ALVIN & THE CHIPMUNKS was in the Top 10 at 0.43. On ID, EVIL STEPMOTHERS premiered at 0.42, well ahead of the 0.30 for its lead-in FEAR THY NEIGHBOR. Tru’s IMPRACTICAL JOKERS dropped 0.05 to 0.38, and after-show INSIDE JOKES was down 0.02 to 0.22. A&E’s 60 DAYS IN edged up 0.02 to 0.36. Lifetime’s MARRIED AT FIRST SIGHT climbed 0.03 to 0.34, and SECOND CHANCES was steady at 0.17. The Obamacare repeal vote was a bonanza for Fox News, which had 3 shows in the Top 20 led by THE FIVE at 0.33. (MSNBC’s THE RACHEL MADDOW SHOW retreated to 0.26, and it may not be unrelated that in its second airing, Comedy Central’s THE PRESIDENT SHOW took a 0.09 hit to 0.13.) Food Network’s BEAT BOBBY FLAY was at 0.30. On HGTV, HOUSE HUNTERS rose 0.07 to 0.30, HOUSE HUNTERS INTL grew by 0.04 to 0.29, and FLIP OR FLOP was steady at 0.27. We’s BRAXTON FAMILY VALUES lost 0.02 to 0.28. Spike’s LIP SYNC BATTLE dropped 0.03 to 0.25. USA’s INSIDE THE FBI jumped 0.09 to 0.22. E!’s SECOND WIVES CLUB debuted at 0.13. POP’s IMPACT WRESTLING ticked up to 0.07. 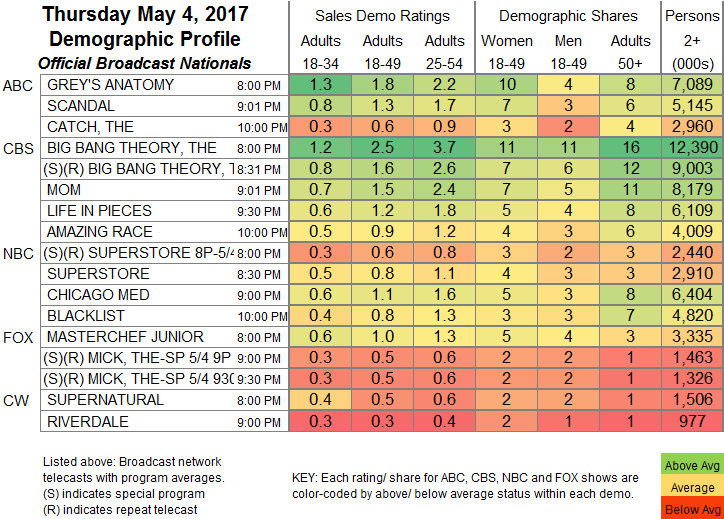 Bravo’s UNPROTECTED was at 0.06/0.05.